K&N Pro Series Oil Filter: The Pro Series oil filters are high quality mid-grade oil filters, co-labeled with the K&N and NASCAR logos. 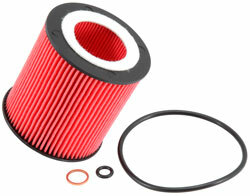 Complete with a fluted black canister, these oil filters are designed for removal using a traditional oil filter wrench. The newly engineered filter media is designed to exceed OE standards for filtration and flow, allowing for a high volume of clean oil to keep your engine well lubricated and free from harmful oil contaminants.